When the reports that Alex Meruelo was purchasing the Atlanta Hawks hit the newswires on Aug. 7 last summer, a reader named Steve Brown posted this comment under a story about the prospective owner in the Atlanta Journal-Constitution: "My boycott is over." Brown's comment was typical. 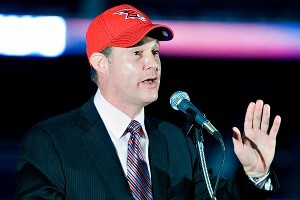 Atlanta fans are clearly dissatisfied with the current ownership of the Hawks, and many likely will embrace the transaction for two reasons: 1) Meruelo said with sincerity in the interview that he wants "to bring a championship to the city of Atlanta;" and 2) Meruelo is part of a new, pioneering era of ownership in professional sports. In case you missed it: Meruelo is about to become the first Hispanic majority team owner in the history of the NBA. And the only thing missing on the back end of his comment about wanting to "bring a championship to Atlanta" that could have sold Atlanta fans further on him might be the tag line made infamous by Malcolm X: "By any means necessary." In a 2004 BusinessWeek cover story headlined "Hispanic Nation," Brian Grow wrote: "It boils down to this: How much will Hispanics change America, and how much will America change them?" Meruelo is stuck right in the center of that question.